Bookshelves made of steel and iron, perfect for a modern and industrial space, is one thing; metal bookshelves with intricate shapes, curvy angles and eye-catching designs is another, as they completely change and revitalise the space they’re put into. That’s exactly the idea behind Brescian Siderio, a family-run company focused on industrial-chic furniture. 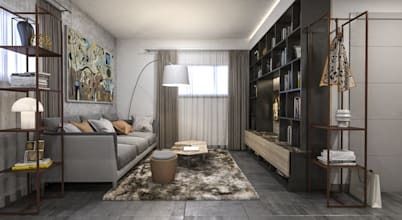 From bookcases and magazine racks to coffee tables and wine racks, Siderio utilise state-of-the-art technology (as well as a firm dose of creativity) to make the metal furnishings that they love – which, as it turns out, is also adored by countless homeowners. Inspired by NY-style lofts and combined with that elegant ‘made in Italy’ touch, the company continues to design and present unique accessories and furniture pieces that can be ideal for the modern-day space – modern, contemporary, industrial, or otherwise. Let’s have a look at some high-class 3D renderings that speak of their tailor-made products.